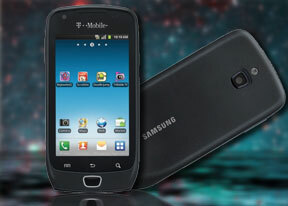 The Samsung Exhibit 4G runs Android 2.3.3 Gingerbread, covered with Samsung’s own TouchWiz UI. The usual four docked icons at the bottom of the screen are present, along with the familiar functionality. The Exhibit 4G supports up to seven homescreen panels, which can host every widget and shortcuts you’ll ever need. However, if you don’t need all seven of them, the unnecessary ones can be deleted. Doing so makes the phone noticeably snappier. Pressing the menu button while on the homescreen lets you add variety of content on it (a press and hold on the homescreen does the same thing), add or delete homescreen panels, change the wallpaper or quickly access the settings menu Live wallpapers are supported as well. The contextual menu has shortcuts too for search and notifications. By default, the main menu consists of side-scrollable panes, much like the homescreen, instead of a vertical scrollable grid (like in the vanilla Android). List view is available too. The TouchWiz preinstalled task manager saves you the need to install a task killer. It gives the user details on RAM usage, the amount of free storage and can be accessed through virtually any spot in the UI by holding the home button. The Samsung Exhibit 4G is powered by a 1 GHz ARM Cortex-A8 processor, and Hummingbird chipset. The device has 329MB of user-available RAM. What’s important however, is that, overall, we felt no lag or signs of inadequate amount of processing power when we used the droid.